Dr. Erika Wierman is an ambulatory veterinary dentist for horses in Lexington, Kentucky and the surrounding region. We prefer her to work with all our horse teeth needs! 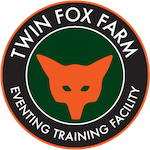 Jumps For Joy sold by Hi-Tech Horse Jumps are the jumps that we prefer here at Twin Fox Farm. We love our new jumps in the arena! Contact Mikki at (319) 360-5511 for more information on the jumps. All of our horses are treated by RevitaVet Infrared Light Systems for preventative and maintenance therapy. Visit them online at www.revitavet.com. Stackhouse Saddles has become the farm’s favorite custom saddle maker designing our saddles. Visit them online at www.stackhousesaddles.com and contact Lesley Ellis or David Stackhouse for a perfect fit for you and your horse. Wise Choice Tack is located in Lexington, KY and is Katie’s favorite store. Dave Baseheart keeps the farm and staff well stocked in tack. Visit them online at www.wisechoicetackandtrailer.com or call (859) 224-8976.